Papa-Nicholas Planas was an innocent and guileless man with deep humility. The prognosticator God endowed him with the gift of foresight while he was still a young child. With the great simplicity that characterized him, he narrated: "One winter night, as we sat at the fireplace, I said to my father: 'Father, at this moment our boat Evangelistria sank outside the City.' Awestruck, our father told my mother: 'Woman, what is the child saying?' And indeed, at that moment our boat sank." And to avoid the admiration of others, as well as the temptation of pride, he would say that "all children have foresight". At fourteen he was left fatherless, and at seventeen he was married in Athens, where he moved with his mother and siblings from his native Naxos. His wife died at a young age, after having given birth to a boy. In the noisy city and amidst many cares, since he was both father and mother for his child and spiritual father for his parishioners, he lived the life of a true ascetic with watchfulness, prayer and a life of worship. The first written witness of the holiness of Papa-Nicholas comes from his contemporary Alexandros Papadiamantis. Papadiamantis was his chanter in the Chapel of the Prophet Elisha, near Monastiraki in Athens. He would chant during Vespers and Matins, Liturgy and Vigils, which were celebrated with solemnity as well as grandeur by Papa-Nicholas. 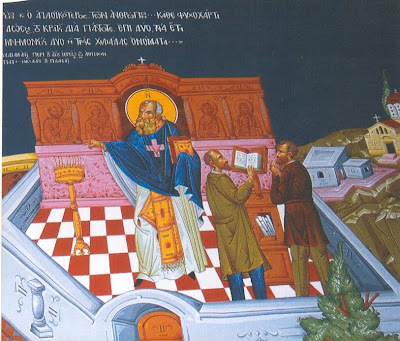 He was able to penetrate the depth of his sanctified existence and realize his numerous gifts, which were carefully hidden under the shell of simplicity and humility, because he also was integrated into the same perspective, that is, he was a bearer of Orthodox Tradition. He calls Papa-Nicholas a worthy liturgist of the Most High and contrasts him with the "professional clergy", as he calls them, saying: "He is the humblest of priests and simplest of people ... he is loveable, simple and virtuous, worthy of the first Beatitude of the Savior." He was, like all the Saints, non-avaricious and merciful. "A lot of money passed from his hands, but he immediately channeled it towards almsgiving. Young deacons as well he helped to go study. Many times he didn't even have a penny on him. Without noticing, once he took a cab to take him to a certain house. When he arrived and wanted to pay, he looked for money, and looked again, but nothing. He was embarrassed. The cab driver said to him: 'Aren't you Papa-Nicholas, the parish priest of Saint John?' 'Yes, my child, it is I.' 'Hey, I don't want money, only your prayers.' Another time, someone "for whom he once read a supplication, gave him a respectable amount as payment in a closed envelope. He, taking the envelope, gave it immediately to a poor woman while the envelope was still sealed, as she waited for him to finish the supplication. The person who gave it to him became upset. Couldn't the blessed one, he said, at least have looked at what I gave him!" He showed great patience in temptations and tribulations and unimaginable temperance. Once he said while advising a spiritual daughter: "With patience, my child, I cast aside all the scandals that presented themselves to me." Great importance was given to attention and the concentration of the mind during prayer and worship. In his teachings to his spiritual children he stressed this point very much. Also, when he came out of the sanctuary to cense, during Matins, many times he would be seen censing an empty chair, while in contrast he would not cense certain bystanders. With his spiritual gift he discerned that some of those physically present were actually absent, since their minds were scattered and wandered about here and there, while others who were absent due to illness or other reasons beyond their will were mentally present and praying during that time. He liturgized often and commemorated at the Holy Prothesis very many names of the living and the dead. He was made worthy to hear the chanting of angels. I encourage the reading of his life, which brings great sweetness in the heart, desire for prayer, repentance, willingness for correction and imitation of his pious life. Source: Ekklesiastiki Paremvasi, "Ο ΑΓΙΟΣ ΠΑΠΑ-ΝΙΚΟΛΑΣ ΠΛΑΝΑΣ (1851-1932)", March 2000. Translated by John Sanidopoulos.